It is that beautiful time of year when patio dining is the most pleasant. These are the days I look forward to for months and once they pass, I am sad to leave behind. 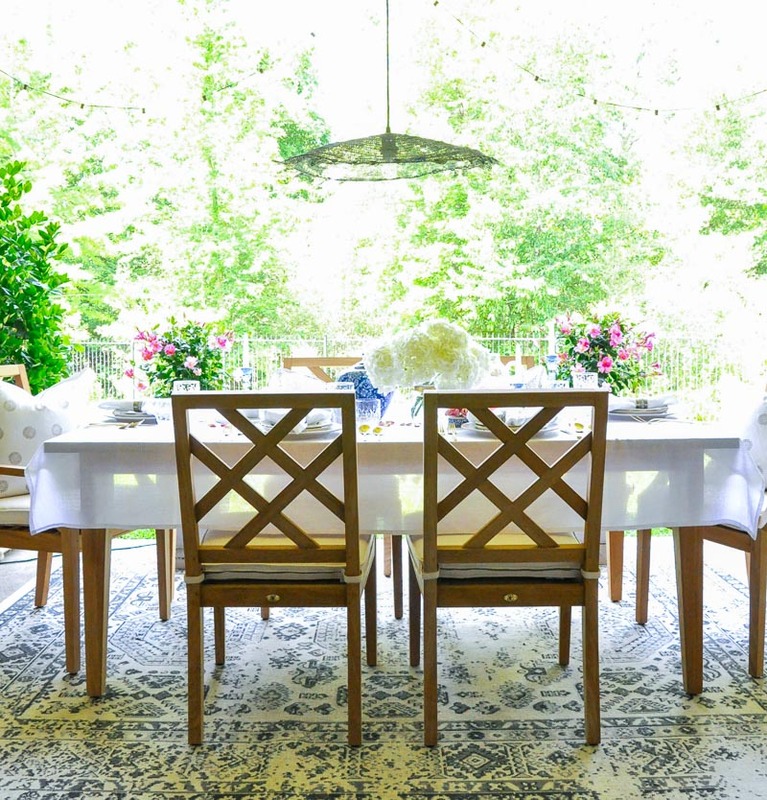 Today, I am excited to be sharing my patio dining room along with ideas to help you create a wonderful space of your own. 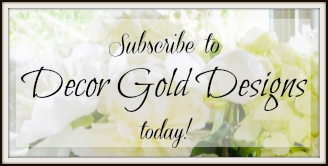 I am also thrilled to be connecting with two of my dearest blogger friends, Bree from ZDesign at Home and Randi from Randi Garrett Design. 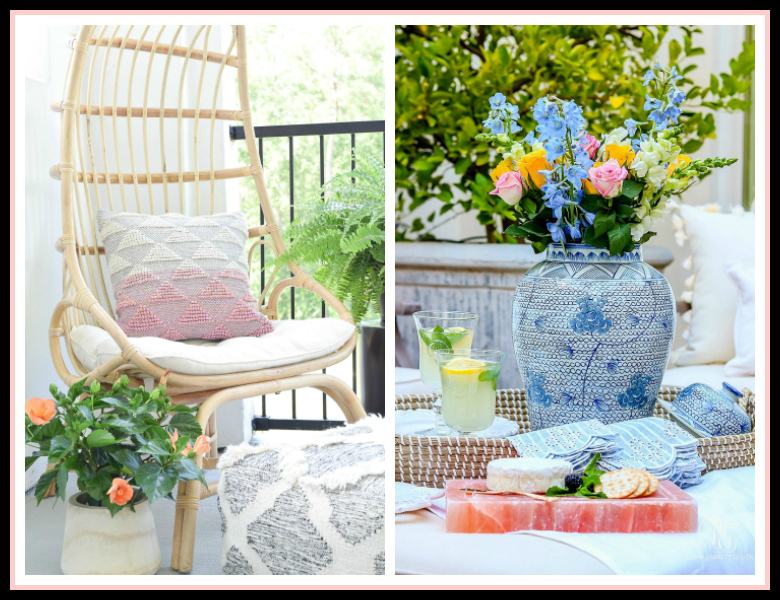 Both ladies have beautifully styled patios and will be offering tips and inspiration. Thanks Bree for hosting our intimate patio tour today!!! 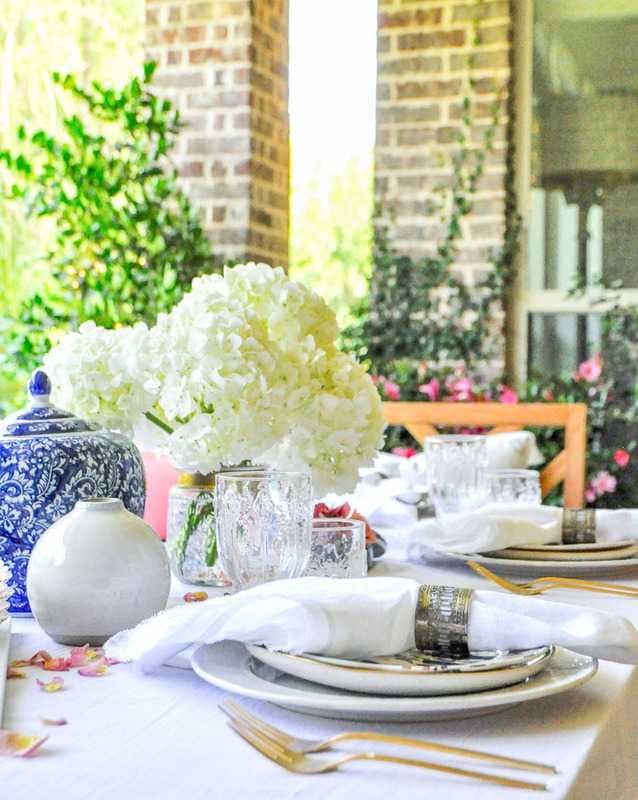 Patio dining never goes out of style. 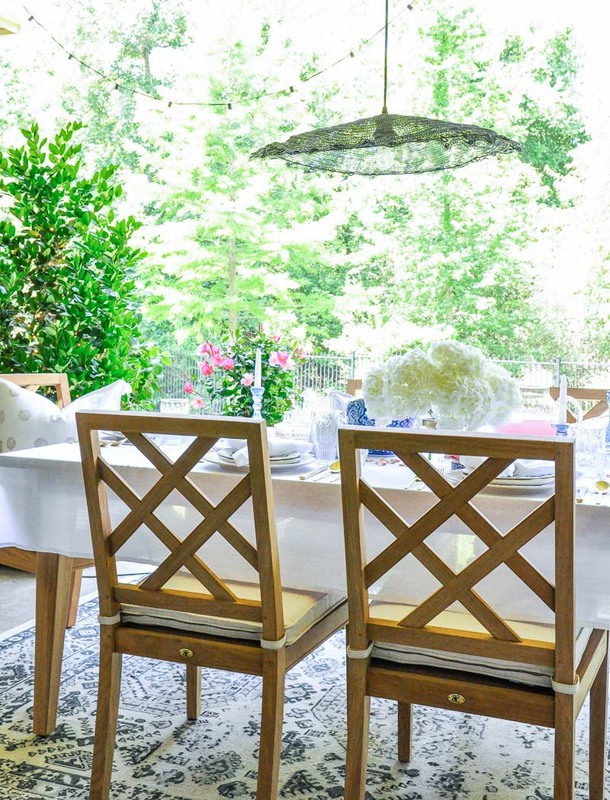 I believe having an inviting spot for outdoor dining is a true blessing. 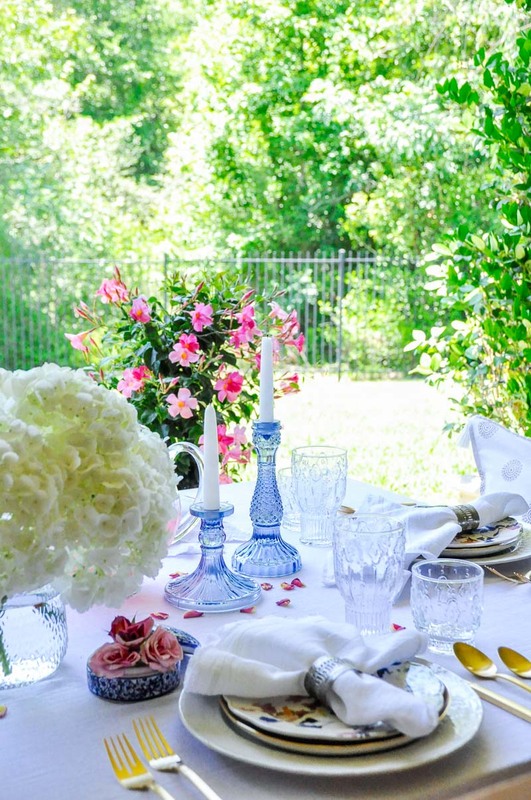 There is a reason the outdoor dining spaces at restaurants are often full. I find myself craving fresh air and beautiful views. 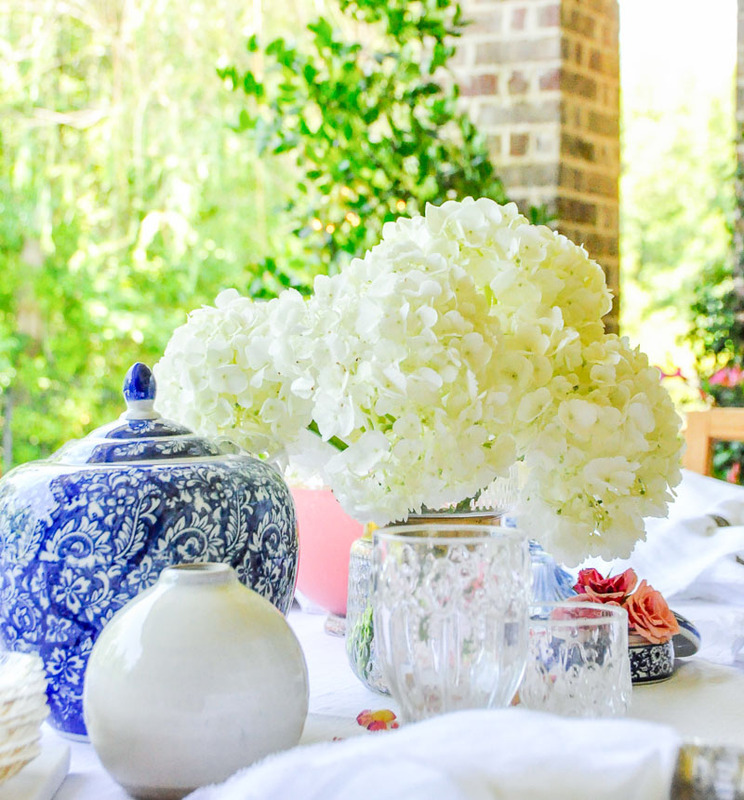 Creating a lovely spot for our summer meals was high on my list when decorating our home. Throughout the process, I learned a few things. Below, I have compiled these ideas, so let’s get started! 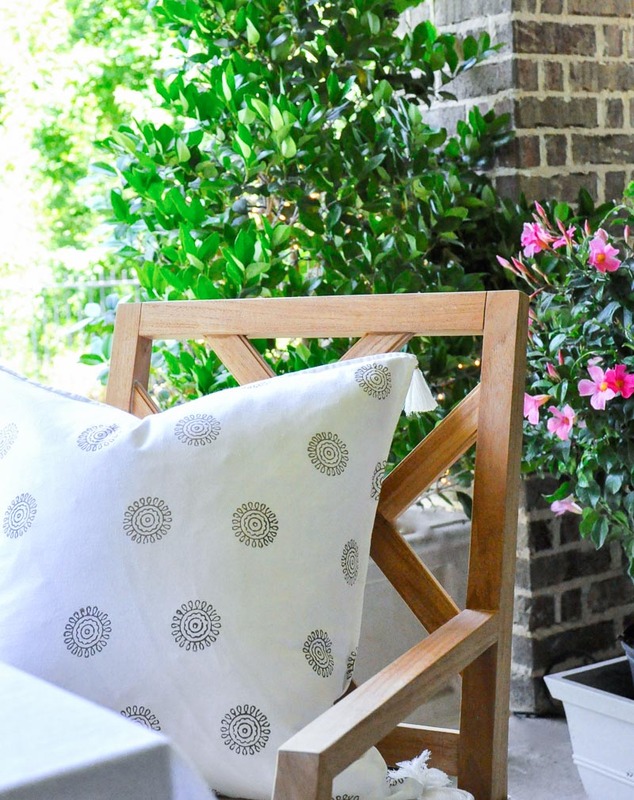 Stylish, weather-resistant furnishings is the place to start. I highly recommend purchasing the nicest outdoor dining furniture you can afford. Your patio should be a lovely extension of your home and the right furnishings provide the most important elements for outdoor dining. Our furnishings are by one of my favorite brands, Summer Classics. Our pieces were selected to withstand the elements. 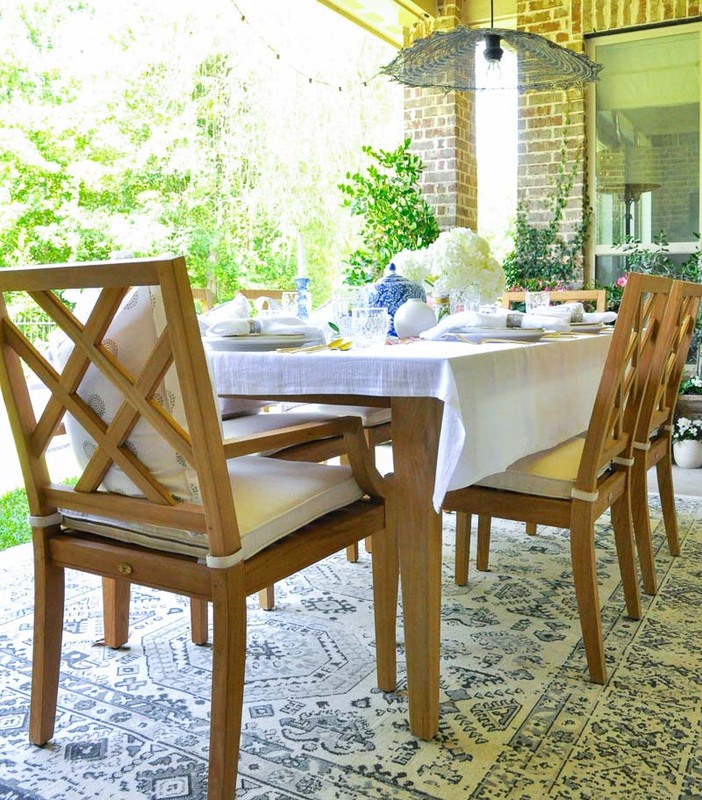 We chose a teak table and chairs because they will age gracefully. We also added weather-resistant fabric cushions. Similar to the rooms inside my home, this area is light, bright and neutral. 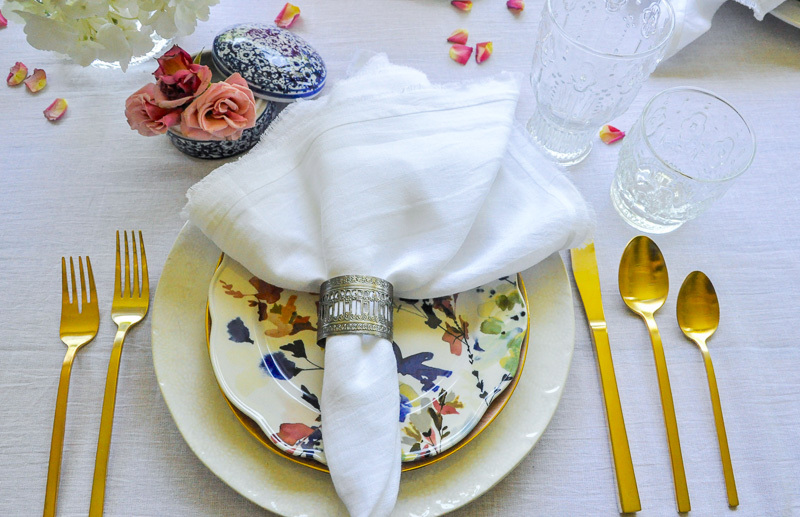 With neutrals, you can add pops of color for a beautiful seasonal look. (Don’t miss this area set up as a beautiful neutral living space)! I prefer to use nice dinnerware, glassware, and flatware. Nothing too fancy, just some of my everyday pieces. If you are entertaining adults, I encourage you to skip the paper and plastic. 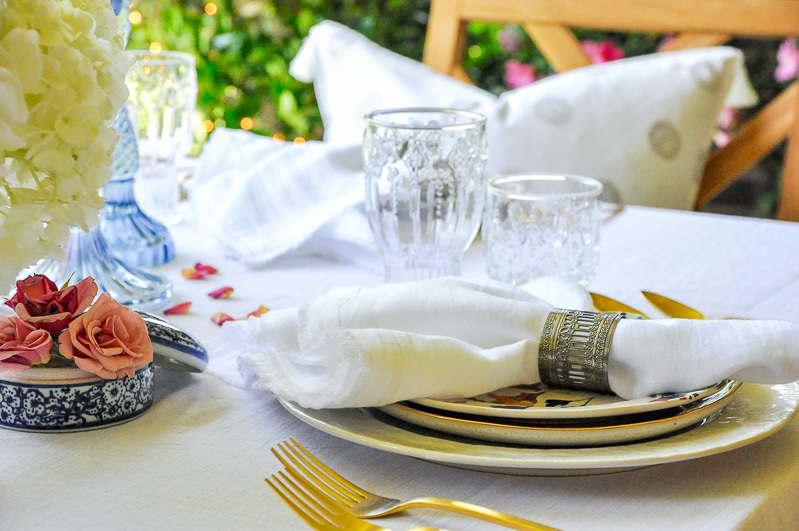 More tips for outdoor entertaining can be found in my Tips for Hosting a Perfect Dinner Party post. 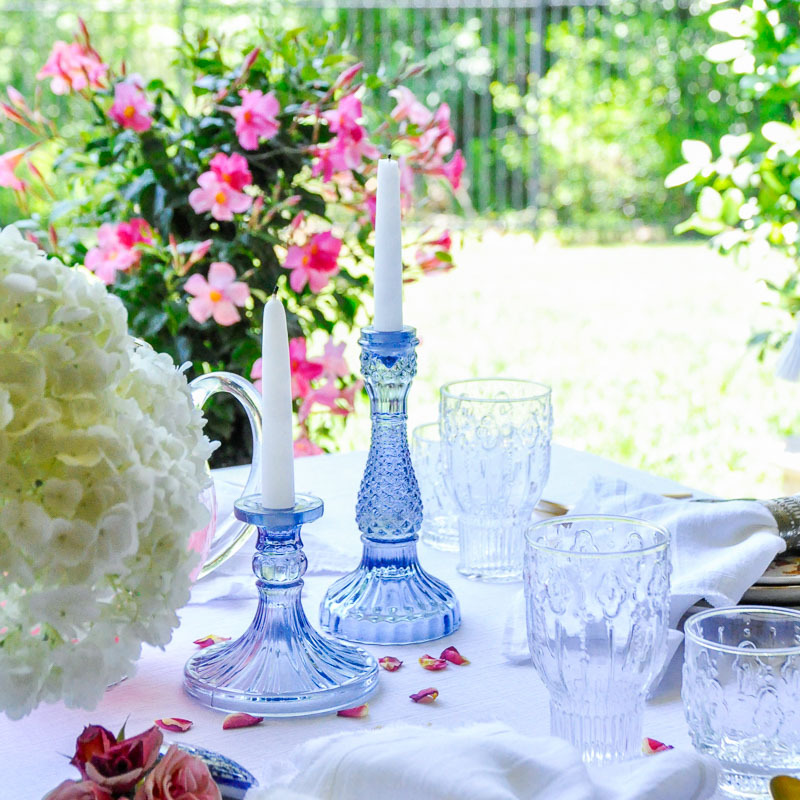 A simple hydrangea centerpiece adds a touch of effortless elegance. 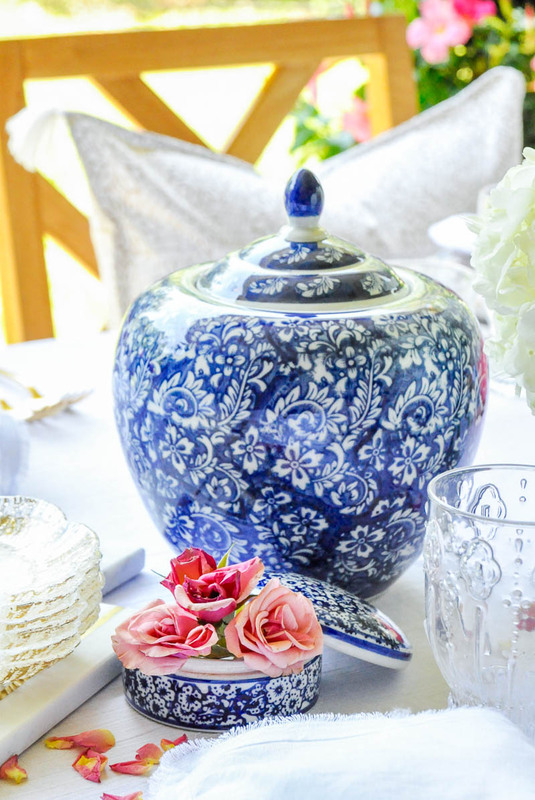 You can simply add a vase full of flowers or include a few extras like ginger jars or a cheese board as I’ve placed around my blooms. I love to finish my spaces with containers of lush plants, string lights, twinkle lights, and candles. They help define the space and help provide intimacy. 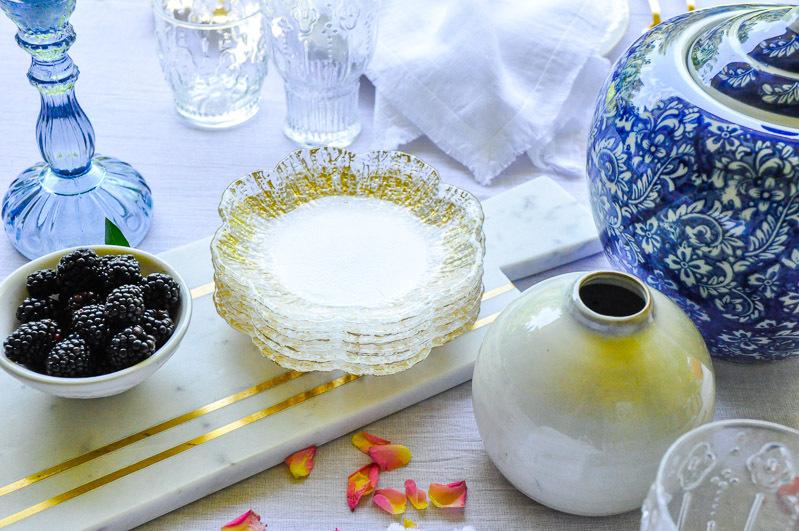 Whether you have a terrace, a sizable porch, a patio, or a rooftop space, I hope you can elevate the look and feel to be fitting for many outdoor meals! Now, I’m thrilled to send you over to tour the patio’s of two of my dearest friends. Not only do they each have beautiful outdoor living areas, they’ve styled them perfectly for you! I love your outdoor patio! I hope you and your husband can enjoy many meals out there this summer! Jen this is so beautiful! I wish I could pop over and enjoy this gorgeous set up with you and Tony! Wishing you a lovely weekend my dear friend! Good post. We eat outside all the time. Our grandkids love it. It’s one of the reasons picnics are so fun, we really like lunch out there. furniture? I was in an upscale upholstery fabric store once and some lady asked what I was trying to match, I then asked her and she said her golden retriever because there was hair everywhere and she was tired of fighting it. terrible! Good for you! I love your blog, but seeing those sweet puppies on furniture made me love you more.